Joseph Maiolo’s basic argument in Cry Havoc is summed up in the book’s subtitle: How the Arms Race Drove the World to War, 1931-1941. Maiolo does not accept the traditional view that the democracies in the years before World War II made a terrible mistake “by failing to arm fast enough to stop Axis aggression”(2). As he sees it, it was the arms race itself, and not the failure of the western powers to participate in it actively enough, that lay at the heart of the problem. The arms race, he argues, was “an independent, self-perpetuating and often overriding impersonal force,” a “vast maelstrom, a tremendous torrent,” a “vicious system” that no one could escape—and which sped, in 1938-39, “toward its inevitable climax”(2-3, 402, 271, 207). H-Diplo/ISSF Roundtable Review of Joseph Maiolo. Cry Havoc: How the Arms Race Drove the World to War, 1931-1941. New York: Basic Books, 2010. ISBN: 9780465011148 (hardcover, $35.00). Even Hitler, Maiolo says, “could not escape the vast arms spiral that he had done so much to set into motion” (272). It was, in fact, because of the arms race that Hitler “did not get the big war against the Soviet Union backed by Britain and Italy that he had originally wanted,” but instead “provoked one against France and Britain”(5). And the arms race, he argues, also had far-reaching consequences at home for all the major powers. “No matter what type of regime or its military starting point,” he says, “the race sent everyone down the same totalitarian track”(4). My own take on the issue is somewhat different. I think that the idea that Hitler, in the 1939-41 period, largely lost control of a process he had done so much to start, is by no means absurd. But this, to my mind at least, was not because of the arms race: the basic problem, in 1939 especially, was political and not military in nature. The argument that Raymond Sontag made over half a century ago—that in 1939 a series of diplomatic moves “intended only as preparatory to a still distant trial of strength, developed into a diplomatic crisis involving all of Europe, and eventually precipated a world war which at the outset Hitler had no thought of starting and which to the end he hoped to avoid”—still strikes me as quite plausible. And indeed Maiolo himself shows that the Nazi leaders (in 1938-39) hoped to postpone the war with the western powers for another few years, when Germany’s lead in armaments (as Göring put it) “would be appreciably more favourable” (288; see also 225, 262, 289, 293). In 1939, he says, Hitler risked “prematurely starting the big war he planned for in two or three year’s time” (294). But that suggests that Hitler did not opt for war because his own strategic window of opportunity had already begun to close in 1939—that because of British and French rearmament, his own armaments lead had already begun to waste away. The problem instead was that the political confrontation with the western powers had reached the point where it was very hard for him to pull back. Joseph Maiolo is Senior Lecturer (and from 1 September 2011) Professor of International History in the Department of War Studies, King’s College London. He received his BA and MA from the University of Toronto, and his Ph.D. from the London School of Economics and Political Science. He is author of The Royal Navy and Nazi Germany, 1933–1939 (Palgrave, 1998); co-author with Kirsten Schulze, Jussi Hanhimaki and Anthony Best of An International History of the Twentieth Century (Routledge, 2008); and co-editor with Thomas Mahnken of The Journal of Strategic Studies. He is currently writing a textbook about the origins of the Second World War for Cambridge University Press. Marc Trachtenberg got his Ph.D. in history from Berkeley in 1974, taught history at the University of Pennsylvania for the next twenty-six years, and has been a Professor of Political Science at UCLA since 2000. He is the author of a number of books and articles on twentieth century international politics, most notably A Constructed Peace: The Making of the European Settlement, 1945-1963, which came out in 1999. His book The Craft of International History, a guide to historical method for both historians and political scientists, was published in 2006. Michael Horowitz is an Assistant Professor of Political Science at the University of Pennsylvania. He is the author of The Diffusion of Military Power: Causes and Consequences for International Politics (Princeton University Press, 2010). His research focuses on international conflict, military innovation, the role of leaders, and the intersection of religion and international relations. He has been published in International Security, the Journal of Strategic Studies, International Organization, Orbis, the Journal of Conflict Resolution, and elsewhere. He received his Ph.D. from the Department of Government at Harvard University. Talbot Imlay is an Associate Professor of History at the Université Laval in Québec, Canada. He is the author of Facing the Second World War: Strategy, Politics, and Economics in Britain and France 1938-1940 (Oxford University Press, 2003), as well as several journal articles book chapters. He is currently writing a history of socialist internationalism, which examines the efforts of British, French and German socialists to cooperate with one another on international issues between 1918 and 1960, to be published by Oxford University Press. He is also co-writing, with Martin Horn, a history of the Ford Motor Company in France during the Second World War, to be published by Cambridge University Press. Wesley Wark is an Associate Professor at the Munk School of Global Affairs at the University of Toronto and a visiting research Professor at the University of Ottawa’s Graduate School of Public and International Affairs. His most recent book is the edited Volume, Secret Intelligence: A Reader (London: Routledge, 2009). He recently served on the Prime Minister of Canada’s Advisory Council on National Security, between 2005 and 2009, and is a former (two-term) President of the Canadian Association for Security and Intelligence Studies. His first book was The Ultimate Enemy: British Intelligence and Nazi Germany 1933-1939 (reissued in paperback by Cornell University Press in 2010). Like Joe Maiolo, he was a Ph.D. student of Donald Cameron Watt at the London School of Economics. Over 65 years after its end, World War II remains a tremendously important topic throughout our society. For academics, World War II is a rich source of information on the behavior of bureaucracies, people, nations, and the interactions between them. For pundits and policymakers, World War II offers lessons in a security environment gone horribly wrong. World War II is still, rightly or wrongly, a prominent source of analogies drawn by policymakers in the public sphere. 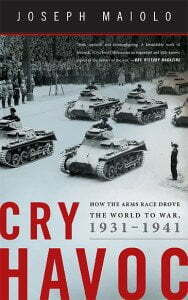 Joseph Maiolo’s new book on the run-up to World War II, Cry Havoc: How the Arms Race Drove the World to War, 1931-1941, makes a tremendous contribution to our understanding about how World War II occurred – and why. It is well-written and draws on an extensive array of primary and secondary sources. One factor driving competition between the major powers and ratcheting up tension around the world was, arguably, the significant arms race that occurred in the second half of the Interwar Period. Maiolo’s book, as he describes in the Introduction, “tells the story of that arms race” (p. 2). Maiolo’s project extends even further, however. His goal is not just to tell the story of the Interwar Period arms race, but also to explain how that arms race helped make World War II more likely. His book offers an impressive account of decision-makers around the world facing down the prospect of an arms race and making decisions based on very similar economic and military factors. Maiolo focuses in particular on the way the pressure of military rearmament forced actors ranging from Great Britain to Japan to embrace the same totalitarian logic of economic production (p. 3). In Maiolo’s words “No matter what the type of regime or its military starting point, the race sent everyone down the same totalitarian track” (p. 4). This argument is fascinating, since it suggests that not only was there an optimal way for a country to prepare for World War II, but that all countries figured out that model, whether or not they were able to implement the necessary reforms efficiently. It is a tremendously ambitious claim and one that should not get lost in his broader argument about the consequences of arms races. However, as a political scientist, I was drawn to think about Maiolo’s contribution in terms of its implications for international security scholars in my discipline. Maiolo’s argument that the arms race in the Interwar Period had an independent effect on both the probability of World War II occurring and the timing of its occurrence places him firmly on one side of a debate about arms races that has occurred within the international security community since the writing of Samuel Huntington and Lewis Ray Richardson, if not before. On one side are those like Maiolo, who argue that, even when you take other economic and political considerations into account, the insecurity caused by arms races makes military conflict more likely in and of itself. On the other side of this debate, however, are those who view arms buildups and the consequences of those buildups as the result of underlying economic and political trends. Thus, rather than seeing an arms race as a contributor to conflict, scholars such as Paul Diehl have tended to see the hypothesized relationship between arms races and military conflict as spurious. Countries do not fight over arms, they fight over issues. Therefore, placing causal credit or blame with an arms buildup risks missing the issues that drove that arms buildup, and the way actors interpreted that arms buildup, in the first place. After all, the United States reacted very differently to Indian acquisition of nuclear weapons than it is now reacting to the Iranian pursuit of nuclear weapons. The political context, according to this line of thinking, plays a significant role in influencing how an arms buildup is interpreted. This dispute also relates to arguments over whether the deterrence model, e.g. “if you want peace, prepare for war”, or the spiral model more accurately describes the way the arms races may shape the international security environment. While Maiolo does not directly engage this international relations literature – and that was not the purpose of his book – I would have liked to see more in the conclusion of his book especially, drawing out the implications of his argument. He uses the dropping of the atomic bomb and the end of World War II as a way to briefly discuss Cold War arms competition and some of the issues that drive military buildups at present (pp. 403-404). Yet he never really comes back to the relative effect of the arms race on the probability of World War II. This matters because in some places, Maiolo clearly argues that the arms race made war more likely, but in other places, he is less clear. For example, Maiolo states in the introduction that Hitler’s unique perspective probably made World War II inevitable, at least in Europe (p. 5), but neglects to explain the relative impact of the arms race in this ‘inevitability’. Did it make the war longer? Did it make the war deadlier? Did it influence the timing of the war, rather than whether or not the war occurred? One gets the sense from Maiolo that perhaps the critical impact of the arms race was actually on the timing of World War II. For example, Maiolo writes that “Germany’s diminishing lead in the arms race encouraged Adolf Hitler to go for broke in the summer of 1939” (295). More assessment on this question in general would have been nice in the conclusion, and I hope the roundtable allows us to hear more from Maiolo on this particular issue. To be clear, I do not mean to suggest he does not have answers to these questions. His research and argumentation are impressive and I suspect he has thought through these issues. Rather, my point is to suggest that the answers to these questions are not entirely clear in the text, and to ask for clarification. Related to the effect of the arms race is the relative weight of political/economic ideology as a driver of arms races. Though Maiolo’s book does not explicitly address dialogues between realists, liberals, and constructivists about the root causes of international behavior, it actually provides some useful evidence suggesting the relevance of each of these accounts. For example, in the book, the Interwar arms race sometimes seems like a very mechanistic process. After all, Maiolo emphasizes – quite rightly – the way that policymakers in each nation, regardless of their underlying political ideology, thought about arms race dynamics and evaluated some of the same variables. The links he draws across time and nationalities are especially impressive. This provides some interesting evidence for more traditional strategic studies perspectives. The fact that leaders evaluated some of the same variables and felt some of the same pressures does not mean, however, that domestic politics and ideology were irrelevant. This is potentially meaningful in two ways in particular that I want to point out. First, domestic politics could shape the strategies countries use to build up arms (with the difference between the United States and many other countries standing out) or the timing of their decisions to embrace “total war” models of production. In England, for example, both Stanley Baldwin and Neville Chamberlin fretted about the need to preserve democracy and free markets even while engaging in an arms buildup (p. 161). And, indeed, England delayed its shift towards a wartime control model of mobilization and arms production in part due to concerns over their political implications. The September 1939 legislation cited by Maiolo is critical in this regard (pp. 316-317). The decision to give the state “sweeping powers” (p. 316) was made in Great Britain through a constitutional process by the legislature, rather than by fiat. Alternatively, Joseph Stalin and Hitler did not worry about running over private industry or the rights of their people, but ideology influenced both of them as well. Maiolo discusses how Hitler’s Four Year Plan document began with his views on history and the necessity of Nazism to defeat the Jews and the Bolsheviks (p. 146). For Stalin’s part, he viewed Hitler’s initial rise as one more example of how capitalism was prone towards disastrous policies (p. 187) and the Kremlin had an “obsession with the peril of “capitalist encirclement”’ (p. 196). Second, ideology and domestic politics could influence the way states evaluate the costs and benefits of alliances with different partners – part of the way they respond to the arms race. Though the West chose to ally itself with the Soviet Union, for example, there is no doubt in Maiolo’s account that ideological differences made that option distasteful. Similarly, though Chamberlain was interested at times in coming to an accommodation with Hitler (p. 237), he viewed the risk and permanence of such an arrangement in a different way than potential links with France and the United States (something Germanofficials noticed as well in their analyses of the Anglo-American relationship, p. 289). Additionally, the way Stalin evaluated his potential adversaries and made decisions seems fundamentally influenced by his Communist world-view, albeit with a healthy dose of realpolitik (p. 209). This made me wonder about whether a democratic Soviet Union/Russia with stronger ties to Britain and France would have made decisions in the same way that Stalin did, both in terms of the pace of its arms buildup and its pre-war alliance posture. In reality, that counterfactual is impossible to answer, but it is hard to tell where Maiolo would come down on that question. In this way, while Maiolo is certainly correct that there were some elements to the arms race that transcended domestic politics, his account is chock full of examples of domestic politics and domestic political ideology playing a critical, if not determinative, role in shaping the timing and content of national decisions. I do not think he would dispute this, but he does not take the time in the text to address the relative import of these issues compared to others. “Historians often remark that it is impossible to think of Nazism, the coming of the Second World War, and the Final Solution without Hitler. But is it as difficult to imagine a European arms race in the 1930s without Hitler? What if General Schleicher had used the army to install himself as dictator? Under a military dictatorship Germany would have rearmed—less rapidly perhaps, but rearmed nonetheless—and by so doing would have invited military escalation from its neighbors. . .Whether a European arms race without Hitler would have ended in another world war or a cold war is another question.” (p. 43). This is a fascinating supposition. The notion that a German-led arms race might have been inevitable with or without Hitler is not often discussed. Maiolo’s logic, however, based on his description of the preferences of the Germany military, makes a great deal of sense. A discussion of Hitler’s role also brings us back to the link between arms races and conflict. In a world without Hitler, the impact of a European arms race on the probability of conflict seems uncertain for Maiolo. Perhaps war would have occurred. Perhaps not. What about a world with Hitler but without an arms race? In that world, it seems as though war might very well have occurred anyway, just without the extended buildup preceding the conflict. What does this mean for thinking about the relative effect of arms races versus other factors as a cause of war? How does this relate to the burgeoning literature within international relations about the relative impact of leaders on national policy? Maiolo therefore provides a fruitful path for future research to build upon. A final substantive point relates to the lessons international relations scholars can draw from Maiolo’s work about the role of learning in international politics. In the paraphrased words of Richard Betts, militaries are often accused simultaneously of preparing for the last war and failing to learn from the experiences of the last war. International relations scholars have found persuasive evidence that both leaders and military officers learn from their own past experiences and the past experiences of their countries. How do the national leaders and military officers of the Interwar Period stack up to that account? In particular, Maiolo’s work emphasizes the way the experiences of World War I shaped how each military viewed itself and the way to prepare for war during the Interwar Period. For example, as the Japanese studied the German defeat in World War I, they learned that “Germany had lost not because its army performed badly but because Germany’s economy had failed” (p. 27). The belief that victory in modern war required total societal mobilization of a sufficiently large resource base, according to Maiolo, helped drive the Japanese obsession first with Manchukuo and then, eventually, with Southeast Asia. Many German officers similarly learned the importance of “mobilizing the totality of the nation’s resources for war” (p. 41). The West learned the same lessons as well. Britain, France, and the United States all feared, to varying degrees, that total societal mobilization to defeat totalitarian regimes risked turned them into precisely the thing they opposed (for example, see the discussion of Chamberlain and the eventual embrace by The Economist of total economic mobilization in 1939 on pp. 296-297). I found this fascinating and wanted to hear more from Maiolo on why leaders and military officers learned the lessons they did and the extent to which those lessons learned shaped their behavior. Essentially, was it the lessons learned that drove the patterns of arms racing? Alternatively, were the modes of economic production in the advanced industrial economies such that the pattern of arms racing that occurred would have been inevitable regardless? On another note, I was unsure about why Maiolo chose to emphasize the action in Europe over the action in Asia. The book does open and close, in some ways, with a discussion of Japanese behavior. Chapter 2 (p. 23) includes the story of Colonel Kanji Ishiwara and the creation of Manchukuo, while the book substantively closes with the Japanese decision to go to war at Pearl Harbor (p. 396). In between, however, it is more a story of Europe than a story of Asia. Maiolo’s story is primarily one about decisions made by Germany and the reaction they provoked around the world. This is common in the security studies literature, so I certainly do not fault Maiolo uniquely. I would have liked to see more explaining and arguing for this framing explicitly. As it was, I greatly enjoyed the sections on Japan. In particular, the discussion of bureaucratic politics in the Japanese military, both the army/navy disputes and the disputes within the navy (in particular pp. 387-389 and p. 392), was very helpful. All in all, this is a terrific book and I hope it is widely read. I look forward to seeing Professor Maiolo’s response to the participants in this roundtable and hope it triggers further dialogue on these important issues. In Cry Havoc, Maiolo sets himself two major tasks, one in which he is extremely successful and the other one in which he is less so. The first task, as mentioned above, is to place rearmament – and military-industrial preparations for war more generally – at the centre of the international history of the 1930s. A great deal of scholarly work has been done on the rearmament policies of different countries, but Maiolo’s book is the first to provide an integrated, multi-national account. Drawing on scholarship in several languages as well as on his own focused archival work, Maiolo charts the efforts of Britain, France, Germany, Italy, Japan, the United States and the Soviet Union to build the armed forces and armaments needed to wage a future war. As he rightly notes, the question in most (but not all) countries was not whether or not to rearm, since the overall trend was for military budgets to climb during the decade. Instead, more difficult questions bedevilled political and military leaders: which armaments to invest in and to produce; in what quantities and in what time frame; and at what opportunity costs in terms of other armaments and non-armaments. No less important were questions concerning the relative importance of various actors in the overall rearmament effort, most notably state officials, military planners, industrialists and workers. At a more basic political-economic level, there was the question of the relationship between the state and the economy, between imposed order of some kind and the influence of market forces. For most of the participants in the arms race these questions could not be avoided, and Maiolo’s account offers a wealth of information for readers interested in the answers arrived at by different countries. Arguably even more valuable is Maiolo’s attention to the interactive effects of rearmament in the countries concerned. Arming is not an absolute but a relative endeavour: during the 1930s no country armed in a vacuum but in relation to other countries, which meant that the perception of progress – one’s own as well as that of perceived rivals – was important, if not critical. As Maiolo shows, the Soviet Union kicked off the arms race with its crash-program of military-industrial expansion during the early 1930s, thus providing Nazi Germany with a convenient excuse for its own burgeoning rearmament effort, which soon provoked responses from Britain and France. As the arms race heated up in Europe, the United States came to play an increasingly important role as a potential and (from the fall of 1939 onwards) actual supplier of money and arms to the western allies, a factor that Hitler could not and did not ignore. Meanwhile, in Asia the simmering imperial rivalry between Japan and the Western states, including the United States, boiled over during the 1930s as the Japanese found themselves bogged down in a war in China that they could neither win nor abandon. With Asia’s future seemingly a stake, the Roosevelt administration decided that it could not allow Japan’s ambitions in China and beyond to go unchallenged, compelling the Japanese to contemplate, however reluctantly, the possibility of a war against the United States. Contemplation, in turn, gave way to the need for hard decisions when, beginning in 1939, the Americans embarked on their own rearmament program that decision-makers in Tokyo correctly assumed would eventually overwhelm Japan’s own efforts. With the clock ticking, Japanese leaders plunged ahead, provoking the United States into war with the attack on Pearl Harbor in December 1939. Hitler’s decision several days later to declare war on the United States, a decision provoked in part by the leaked news in the fall of 1941 of a massive military program by the United States, fused together the Asian and European wars, transforming World War II into a global conflict. This brief outline cannot do justice to the narrative brilliance of Cry Havoc. Writing with considerable verve and erudition, Maiolo knits together developments in different countries, providing a deeply researched, thoughtful and succinct account that clearly demonstrates the value of his focus on rearmament. All the major countries rearmed and, as Maiolo shows throughout, their rearmament cannot be divorced from the political, military and strategic developments both within each country and between them. For anyone interested in the subject, Maiolo’s book is an excellent place to start and it will enjoy a prominent place on reading lists dealing with the war and its origins. I cannot emphasize enough the success of Cry Havoc on this score. This is certainly a bold argument: taking on a life of its own, the arms race over the course of the 1930s developed into a Frankenstein’s monster, escaping the control of its creators and, indeed, transforming them before finally propelling them into war. The argument, however, is not entirely convincing. Such a totalizing process, however, does not fit developments in the different countries – developments which Maiolo discusses in his book. True, the Soviet Union possessed a highly regimented economy from the beginning, and Germany’s became increasingly so, especially as the war dragged on. But neither France’s emerging war economy nor that of the British either before or after 1939, resembled Maiolo’s model. Increasing constraints there certainly were, but in both countries market forces, not to mention parliamentary democracy, were alive and well – and, indeed, for some observers, all too well. If anything, the model is even less useful for the United States, which, as Maiolo recognizes, succeeded in producing vast amounts of armaments with only minimal restrictions in the economic and political realms. All told, Cry Havoc points to the diversity of political-economic approaches rather than to their increasing convergence on one type. But there is perhaps more to be said on the subject. Rather than a precursor, the Soviet Union is better viewed as an exception: its system of highly centralized, dictatorial and coercive direction of the economy by the state was without parallel. If this system clearly corresponded to Soviet ideology and political practice during the inter-war years, it was also arguably the only one possible in the catastrophic circumstances following the German invasion in 1941, when the Soviets found themselves in a full-scale war with a greatly diminished resource base. From this perspective, the United States, which was endowed with comparatively unlimited supplies of resources, constituted another exception. The United States not only out-produced everyone else, but it did so while maintaining a thriving civilian economy and its capitalist system largely intact. The remaining countries – Britain, France, Germany, Italy and Japan – fell somewhere in between these two polar opposites. In each country mounting armaments production created economies of scarcity in which supplies of various resources proved inadequate to meet growing demands. Scarcity led to pressure to establish priorities among competing consumers and to allocate resources accordingly, which in turn raised the question of who should be responsible for these vital tasks. Precise answers to this question varied across countries, but in each case the answer emerged out of a political process of negotiation (and sometimes confrontation) between various combinations of actors, including bureaucrats, military officials, industrialists and labour leaders. The answers worked out, moreover, involved a balance between pre-existing “varieties of capitalism” and state direction and regimentation. To be sure, this balance was subject to change during the 1930s, usually (but not always) in the direction of greater state involvement. Early in the decade the Depression contributed to calls for interventionist policies, often under the vague rubric of “planning”. Later in the decade the expanding rearmament efforts, which had the effect of widening the gap between available resources and demand, increased the pressure for a more activist state. That said, the overall change was limited: in Britain, France, Germany, Italy and Japan the balance for much of the pre-war and even wartime periods favoured capitalism far more than Maiolo’s model allows. There are several reasons for this, not the least of which was the deeply-rooted belief, shared by almost all sections of inter-war Europe’s political spectrum, in the efficiency, dynamism and productive power of market forces. In Chapter 17, Maiolo quotes U.S. Secretary of War Henry Stimson that “If you are going to…go to war…in a capitalist country, you have to let business make money out of the process or business won’t work.”  It would not be too difficult to find similar statements made by prominent figures in almost all the countries concerned, with the notable exception of the Soviet Union. Many people at the time would have agreed that market forces needed some guidance from the state, but the conscription of industry and industrialists did not belong to the realm of practical politics. Another problem with the argument that rearmament compelled all countries to transform themselves into highly planned and regimented societies is that it confuses rhetoric and reality. As Cry Havoc makes clear, during the inter-war years there was a great deal of talk in various countries about the total or totalizing nature of future war. The next war, any number of commentators insisted, would demand the mobilization of all the nation’s resources, effacing boundaries between soldier and civilian and between the military and home fronts. Yet with the possible exceptions of the Western parts of the Soviet Union during 1941-44 and most of Germany during the opening months of 1945, the war efforts of the major belligerents did not approach this extreme. To be sure, vast efforts and wealth were expended, and death and destruction did occur on a colossal scale throughout much of the war; but the belligerents did not transform themselves into total warfare states. Equally to the point, talk of total war often served a variety of political purposes. In the case of France it masked reality. The 1938 French law on the mobilization of the nation in wartime was not, as Maiolo suggests, evidence that the arms race had compelled France to adopt “Authoritarianism”. Quite the opposite: the product of fifteen years of political battles, the final version of the law had been gutted of almost all of its coercive provisions. More often the rhetoric of total war had an invocatory, almost incantatory aspect. Associating the future with total war served as a goad to action, as a call for greater preparations and effort – and, of course, for larger military budgets. It was, more than anything, a criticism of the present state-of-affairs. It did not describe reality; nor did it offer a blueprint for the future. The designated goal was too vague, too open-ended, too much a counsel of perfection to have much purchase on the present or the future. Thus when Goebbels in February 1943 pronounced his total war speech to a huge crowd in Berlin, he and his political allies were expressing their profound dissatisfaction with current policy. They sought a radical change of course, one that implied not only greater sacrifices on the part of all Germans but the fusion of the regime and people that the Nazis had been proclaiming for years. After almost four years of warfare, the principal problem for Goebbels was that Germany was not waging anything near a total war. And if this was true of Nazi Germany, what of the other belligerents? The biggest problem with Maiolo’s thesis, however, is that it downplays the ideological mainsprings of rearmament policy, particularly in the Soviet, German, Italian and Japanese cases. The massive Soviet rearmament effort during the early 1930s stemmed from the conviction that the Soviet Union was surrounded by aggressive enemies intent on its destruction, a conviction rooted in the ideological assumptions of its leaders as well as in their experience of civil war and foreign intervention during 1917-1921. As Stalin remarked more than once, the Soviet Union and the communist revolution (which quickly became one and the same) would either triumph over the remaining, capitalist world or would be destroyed. It was very much either-or. For Nazi Germany, Fascist Italy and Imperial Japan, a military build-up would provide the necessary instrument for fulfilling their respective imperial visions, whether in Eastern Europe, the Mediterranean or Asia. For these regimes, empire was a precondition not only for survival but for victory in the dog-eat-dog world that they imagined and that they went a horrifically long way towards creating. This is not necessarily to equate the three imperial projects. For all the brutality and exploitative nature of Japanese and Italian imperialism, it does not appear that either Fascist Italy or Imperial Japan conceived of anything on the lines of the Nazis’ Generalplan Ost, which foresaw the forced migration and death of tens if not hundreds of millions of people in Eastern Europe. That said, all three imperial projects – and, for that matter, the Soviet version in the form of a world-wide victory of communism – were framed in either-or terms: either empire or utter defeat and the disappearance of the nation and its people. Equally pertinent, all three imperial projects could only be achieved by force, which is to say, war. It was not the arms race that pushed these regimes into war but the nature of their imperial ambitions. The German case illustrates well the problems with Maiolo’s thesis. Once installed in power, the Nazi regime began to rearm as fast and as extensively as it could. As Maiolo and others show, this policy quickly ran up against the reality of Germany’s limited resources, a reality that stirred calls from some quarters for a scaling back of the overall effort. But Hitler and his acolytes repeatedly refused to heed these calls, preferring to forge ahead regardless of the ensuing problems. As Hermann Göring, the head of the recently created 4 Year Plan, informed industrialists in December 1936, the phrase “it’s impossible” simply did not apply to rearmament. Germany, he tellingly added, was already in an undeclared war whose outcome would be “victory or defeat”. Maiolo cites an extensive passage from this meeting but does not seem to draw the larger point. In 1936 Göring (and Hitler) chose not to take his foot off the rearmament pedal because to do so meant abandoning the regime’s raison d’être, which was to create a racial-territorial empire in Europe by conquest. Neither Germany’s continued economic difficulties due to heated rearmament, nor the expanding rearmament efforts of the British and French, would alter their determination to pursue this larger goal. Thus in the late summer of 1939, when faced with the likelihood of a European war if Germany attacked Poland, Hitler refused be deterred, ordering the Wehrmacht into action for September 1st. For Maiolo, Hitler’s calculations are all about the arms race, a point underscored by his treatment of the decision to invade the Soviet Union. In Cry Havoc, Hitler is pretty much forced to undertake an invasion, faced as Germany was by the long-term certainty of losing an arms race to the burgeoning Anglo-American military-industrial colossus on the one-hand and the fast-rearming Soviet Union on the other. Barbarossa is thus the culmination – or climax – of the arms race unleashed at the beginning of the 1930s. Maiolo is certainly right to argue that Hitler was concerned by Germany’s mid-term and long-term strategic prospects in a larger global context. But what his account largely leaves out is the ideological origins of Hitler’s decision. The German leader did not turn against the Soviet Union reluctantly; he did so enthusiastically and very early-on (July 1940) following Germany’s stunning military victories in Western Europe, eager to embark on the war of imperial and racial conquest in Eastern Europe that lay at the heart of Nazism. For Hitler, all preceding developments – the seizure of power, rearmament, the destruction of Poland, the campaign in the West – paved the way for the war of conquest against Judaeo-Bolshevism in the East. This was the war he had dreamed about for years, and the one he chose as soon as the opportunity presented itself. It was ideology and not the arms race that drove Hitler – and, ultimately, the world – to war. In Cry Havoc Maiolo outlines two possible responses to the criticism that he downplays the role of Nazi ideology. The first, suggested on page 43, is that even a non-Nazi German government would have rearmed during the 1930s, thus triggering responses from other countries, leading to an arms race. That a conservative, military-dominated German government would have striven to free itself from the military fetters of Versailles is highly plausible; that it would have so deliberately ignored the political, economic and international constraints working on Germany and have launched into a European war is far less so. For proof one need only point to the counsels of caution coming from leading German military figures among others from the mid-1930s onwards. Although Hitler certainly did argue in 1937, in 1939 and again in 1940-41 that time was working against Germany, it is extremely difficult, if not impossible, to measure the relative weight of political opportunism, ideological assumptions and “objective” strategic assessments in his claims. Hitler often pitched his message to his audience, and in 1938-39, for example, his audience included military leaders uneasy about the prospect of a European war. The argument that time was an enemy was meant to convince them that now was the moment to act. Equally pertinent, Hitler’s conception of history – and thus of unfolding time – was shot through with personal, national and racial apocalypticism. It is far from clear that his sense of waning time simply reflected his assessment of the arms race. It is safe to say that Hitler viewed war as valuable in itself. But this belief aside, the German leader recognized that Nazi imperial ambitions could only be achieved by means of a European war. Neither the British nor the French, and certainly not the Soviets, were going to acquiesce in Germany’s enslavement of the continent. And given Germany’s inadequate resource base, any European war was going to be a huge gamble. From this perspective, neither 1939 nor 1941 were unfavourable moments for Germany, which is another way of saying that Hitler’s decisions were not forced on him by the arms race but by his burning impatience to get on with the task of empire-building. If he had not wanted war in 1941, for instance, Hitler could have found reasons for delay, among them the possibility of a Nazi-Soviet condominium over Europe against which the British and Americans could have done very little. In the end, I have the impression that it was Maiolo who became a prisoner of his thesis. In arguing so forcefully for the independent nature of the arms race, he is forced to downplay the fundamental source of the radicalizing dynamic pulsing through international politics during the 1930s: the urgent and aggressively expansionist imperialism of Nazi Germany and, to a lesser extent, of Fascist Italy and Imperial Japan. The “do-or-die” language and logic employed by key decision-makers in these three countries were not, as Maiolo insists, a characteristic of the arms race. Rather they were a central feature of Nazi, Fascist and Imperial visions of empire – visions whose individual as well as shared origins merit further study. The international armaments rivalry of the 1930s was the most intense the world has ever known. In absolute figures, global weapons expenditure in the four years preceding 1939 was perhaps triple that in the four years preceding 1914. On the eve of war military spending as a proportion of GNP topped 20% in Germany, France, and Britain, which in peacetime was unprecedented, and exceeded the proportions not only in the United States but also probably in the Soviet Union at the peak of the Cold War. It is unsurprising that in April 1939 British Premier Neville Chamberlain told his Cabinet that “it was a mockery to call the present conditions ‘peace’” (p. 297). Since the opening of the archives several pathbreaking studies have illuminated the strategy and armaments policies of the individual Powers – including those by Robert Frank and Martin Alexander on France, Richard Overy and Adam Tooze on Germany, John Gooch and MacGregor Knox on Italy, and George Peden and Joseph Maiolo himself on Britain – but Maiolo is the first historian to survey the 1930s arms race as a whole. In spite of the forbidding complexity of the phenomenon, he provides a remarkably lucid account, written to be accessible to a general audience, but one that specialists – and international historians in general – will read with great profit. He writes on the basis of a thorough understanding of the domestic political and economic circumstances of the societies concerned as well as of diplomacy and the interactions between them. He draws on archival source material from Britain, France, Germany, Italy, the United States, and Russia. He shows an impressive command of the material published by contemporaries, and of a voluminous and still expanding body of historical scholarship. The metaphor of an armaments ‘race’ was current at the time, although as the British Chancellor of the Exchequer, Sir John Simon, pointed out, no government knew precisely where the finishing tape would lie (p. 249). Governments had the sense of a phenomenon (likened by Maiolo to a ‘vortex’) that was out of their control and bigger than any of them: yet their own decisions created and fed it. Two fundamental issues are raised – the causes of the arms race, and its connection with the outbreak of war. Maiolo’s opening chapters concentrate on 1933-35 and the realignments of international politics as the arms race began. Before this turning point Germany was still largely disarmed under the Versailles peace settlement, the world’s navies were regulated by the 1921-22 Washington Treaties, and the Geneva disarmament conference was in session, while the Great Depression created enormous pressures within the capitalist countries to cut spending. Within three years the picture was reversed. Maiolo downplays the role of technological innovations, though notes that they were most prominent in aviation, with the advent of fast all-metal, single-wing fighters and giant four-engined bombers, and that air force budgets grew fastest. On land and at sea, the pace of change was slower, despite army mechanization and the trend to monster battleships (but in much smaller numbers than before 1914). Maiolo also queries the importance of a business-led ‘military-industrial complex’, even though during the 1920s many arms firms had faced bankruptcy from lack of orders. His stress is rather on military officials and political ideologues, and the lessons learned from 1914-18: particularly on the imperative for total industrial and economic mobilization in the next conflict. Mikhail Tukhachevsky in the Soviet Union and Ishiwara Kanji in Japan were cases in point, as were Benito Mussolini and Adolf Hitler. One of the book’s themes is that of how they and those who thought like them gained the upper hand over more cautious leaders, while diplomats and finance ministers were dragged along in their wake. In general among the theoretical approaches, Maiolo prefers the ‘action-reaction’ model with its emphasis on the role of international political conflict, but at the beginning of the 1930s tensions between the Powers were low, and armaments competition most striking between Italy and its enemies (notably France) in Europe and between the Soviet Union and Japan in Asia. Indeed Maiolo starts his account in Moscow, where a general fear of capitalist encirclement after the 1927 war scare encouraged the stress on rearmament and on supporting industrial capacity in the First Five-Year Plan. In contrast, although international alignments were less cohesive in the 1930s than before 1914, by 1936 Europe had to a large extent polarized between democratic and fascist blocs. By 1936 also contemporaries were well aware that armaments competition had accelerated; by 1938-39 still more so. Maiolo shows how the last three years before the outbreak of the Second World War in Europe resembled those before the First, as successive diplomatic crises prompted decisions in all the powers to increase the pace of spending. None the less, a fundamental distinction remained between the Germans and the others. Hitler and his circle were determined not just to stockpile weapons as rapidly as possible for deterrence and as an insurance premium but also to use them for coercive diplomacy and ultimately to fight a major war. Their counterparts in Italy and Japan also wanted rearmament and believed in violence as a good in itself, but looked to smaller and more manageable, more opportunistically selected conflicts. The thinking of the Soviet leadership is less clear, but most likely was similar. In contrast the British, French, and Americans accepted the need to replace obsolescent fighters and warships (in part as a recession-beating device); but larger-scale rearmament they embarked on only reluctantly and belatedly, well aware of its cost, danger, and unpopularity with their electorates. Many Western politicians and thinkers feared they could keep pace only by abandoning liberal economics and democratic politics: in fact by becoming the mirror image of their enemies. None the less, Maiolo follows commentators such as Overy and Tooze in demonstrating how by 1938-39 the balance was shifting and Mussolini and Hitler felt that time was working against them. Although he does not support his analysis with tables of comparative expenditure and output (and admittedly the statistics from the period need to be used with extreme care) he assembles choice quotations and selections from contemporary minutes and memoranda in order to document the shifts in perceptions. Whereas in 1936 Hitler had still seen his military preparations as primarily directed against the Soviet Union, two years later he regarded France and Britain as his most immediate great-power antagonists, with the USSR and the United States more distantly behind them. As his enemies rearmed in response to his initiative so he feared that from at latest 1942 his advantage would be slipping. In fact Maiolo demonstrates that in summer 1939 – just when Hitler most wanted to step up weapons production – shortages of raw materials (especially steel) forced the Germans to trim their over-ambitious targets. Conversely the British and French leaders now felt much more optimistic, in part because their defence programmes were maturing, although they feared that such intense rearmament was not feasible for long. As in 1914 the German leadership feared that it would forfeit its advantage if it hesitated; whereas its opponents felt more confident than previously that they could risk and if necessary accept hostilities. Maiolo’s concluding chapters, unusually, take the story beyond 1939 to 1941. Given his stress on the comparative success of French rearmament he has to account for the debacle of May 1940, which he does by underlining how contingency and good fortune enabled the Germans to catch the Allies unawares. He clarifies how fear of a worsening strategic balance influenced Mussolini’s decision to intervene and Hitler’s to invade Russia. Similarly the Japanese leaders foresaw before Pearl Harbor that unless they struck now American naval armaments would dwarf theirs in two to three years’ time. By this point, however, the arms race takes more of a subsidiary role in a predominantly diplomatic and strategic narrative of the globalization of the conflict. The book’s suggestion in its title that the arms race ‘drove the world to war’ actually exaggerates its thesis, which integrates armaments with other factors, and gives due weight to the mindset of the political and military elites in the revisionist countries as the driver of the whole process. That being said, the form taken by the armaments race as it developed was crucial in persuading Hitler to modify his conceptions and to start a war against the British that he had not originally envisaged. Maiolo suggests that even without Hitler’s seizure of power the authoritarian and nationalist Germany that emerged in the 1930s (and which had started rearming in 1928) would have challenged the Western Powers, and the chances of general disarmament were always minimal. But without the extra demonic element that the Nazis provided, it is much less likely that the arms race would have ended in hot, as opposed to cold war. Indeed, Neville Chamberlain’s ambition to restore deterrence and gain diplomatic leverage at minimum cost through air rearmament strikingly anticipated Western nuclear doctrine after 1945. To read these pages is to be forcefully reminded of just how dangerous a location Europe was just seventy-five years ago. None the less, as Maiolo’s formidable research establishes, and his conclusion underlines, the issues his analysis raises are no less disturbingly relevant in our own time. Joseph Maiolo’s substantial study of great power thinking and practice on rearmament in the interwar period begins with a dedication to that great scholar of international history, Donald Cameron Watt. It’s a fitting and generous dedication on the part of a former student, but also appropriate in that the sweep and ambition of Maiolo’s study complement D.C. Watt’s own substantial account of the immediate origins of the Second World War, How War Came. For my money, the Watt book remains one of the very best accounts and so Maiolo’s study is in formidable territory. Cry Havoc also opens with two quotations from Shakespeare’s Julius Caesar, a jaunty start and a high calibration for any study to match. The first thing to be said about Cry Havoc is that it is genuine international history. Its chapters cover developments in military policy in the Soviet Union, Japan, Germany, Italy, France, the United Kingdom and the United States. These chapters are worthy essays in their own right, opening up many new perspectives and based on extensive reading. Maiolo also uncovers common ground in the thinking on rearmament and war that links fascist, democratic and quasi-Marxist regimes tightly together. As he notes, much of this thinking was rooted in the common experience of the First World War as a Total War, and many of the prescriptions for dealing with the totality of war that emerged after 1918 were remarkably similar, at least in theory; at least before they got put into practice by different sorts of regimes and leaders. Maiolo’s global survey of the interwar arms race is handled with aplomb and surety. This makes Cry Havoc a book that readers can either embrace as a survey or treat as a collection of insights into the historical development of arms races in individual regimes. From my perspective, its strength lies more in the detailed treatment of country-by- country developments, than in the over-arching theme. Maiolo’s over-arching theme is that arms races were the key dcterminant of the outbreak of World War Two, both in its timing, belligerent line-up, and manner of fighting. This meta thesis doesn’t quite measure up. Britain and France were, as 1939 progressed, feeling increasingly confident about the development of the military balance and this perception clearly influenced their willingness to first risk, and then accept, war with the Third Reich in September 1939. But a concern about the bankruptcy of appeasement policy, and a growing moral outrage at the conduct of the Nazi regime, are also parts of the story that don’t quite fit the arms race frame. Neither Britain nor France were driven to war principally by arms race pressures or calculations of the existing military balance in 1939. Such pressures and calculations can reasonably be said to have helped set the stage for a decision on war in 1939, but the real determinant was, I believe, growing ideological and political opposition to an aggressive and militant Germany. Intelligence assessments that suggested to British and French decision-makers that a war with Germany could be fought and won helped in the decision, but didn’t of themselves take either country to war. Curiously, it is the states that at least temporarily abstained from the war that most accurately reflect the Maiolo thesis about the primacy of military calculations and the pressures of the arms race. Il Duce’s Italy and Joseph Stalin’s Soviet Union were both states that knew, at least in 1939, that they were profoundly unready for war and that their own previous efforts to arm themselves had been inadequate. That knowledge lost its grip on the increasingly bombastic calculations of the Italian regime as 1940 unfolded. But it retained its grip on the USSR’s official thinking, up until the moment when Operation Barbarossa shattered Stalin’s illusions that he could keep war at bay until a moment of his choosing. The United States, another war abstainer at the outset, has to be considered an outlier to this story. Maiolo has interesting things to say about military doctrine in the U.S. before World War Two, particularly with regard to divergencies between military thinking and that of President Franklin Roosevelt on just what kind of armory the United States needed. But it is hard to see that the United States was principally driven by arms race pressures in its calculations on war and peace. What drove the United States to war was, of course, the Japanese attack on Pearl Harbor and the amnesiac decision by both Nazi Germany and Italy to follow suit and themselves declare war on the United States. Maiolo gives only cursory attention to the fateful Japanese attack, despite the wealth of English-language historiography that now exists on the origins of the Pacific War. He develops a selective argument to suggest that the Japanese decision to go to war in December 1941 was based on an assumption about a moment of strategic opportunity that had to be seized in the face of increasing U.S. military strength and a tightening economic noose around Japan. This is an argument that suits the book’s thesis but doesn’t really capture the context and intellectual spirit of Japanese decision-making and ignores the role played by the Japanese government’s belief in the intangibles of their prior war experience, martial spirit, homogeneous culture, and racial superiority, and the relative denigration of the United States as a war-fighting nation. It might be enough to sustain the arms race thesis if Maiolo could convincingly show that the Third Reich was carried into war in 1939 on the dynamics of arms races and calculations of the military balance and dragged others into the conflict in its wake. Maiolo tries his best to make this case, arguing for example, that the “underlying rationale” for Hitler’s decision on war in 1939 was the arms race (p. 294). In support he quotes Hitler’s speech to his generals four days before the attack on Poland in which, among other things, heargued that because of Germany’s economic restrictions it had “no other choice, we must act…” (p. 294) But a Hitlerian rhetorical assault on an officer corps that he generally distrusted (perhaps with good reason) cannot stand in for a wider appreciation of the motives that drove the German Führer to war. Just one page earlier in his account, Joe Maiolo captures some of these considerations when he talks about Hitler being driven by “a powerful sense of destiny, regret over having lost his nerve back in September 1938, and sheer rage against Britain.” (p. 293) A Hitler who willed war cannot be one and the same as a Hitler driven to war by the “vast maelstrom” of the interwar arms race, whose dynamics proved beyond his control. But even if Maiolo’s overall thesis does not provide a compelling account of the outbreak of World War Two, Cry Havoc remains, in its detailed treatment of the armaments policies of the major powers, in its effort to link these policies to the received lessons of World War One, and in its search for a common ground among states preparing for the next war, an important and worthwhile study. The twin passages from Shakespeare’s Julius Caesar that Maiolo quotes at the opening of his account remind us that there are two competing visions of how wars begin. There are belligerent states whose leaders would “cry havoc and let slip the dogs of war,” of whom Hitler is surely one. And then there are states whose leaders would attempt to take the measure of the “tide in the affairs of men, which taken at the flood, leads on to fortune.” That tide is always difficult to calculate but some leaders in the late 1930s tried. Britain’s Neville Chamberlain and France’s Eduard Daladier were hardly men of Shakesperian stature, but they and their governments were engaged in a calculated struggle, however bad the calculation, and shared none of Hitler’s enthusiasm for crying havoc. War was willed in 1939 rather than ordained by an out-of-control arms race dynamic. Joseph Maiolo’s study of the arms race dynamic tells us a great deal about the visions of war entertained by military and economic elites in all the major powers of the day. It doesn’t really need its over-arching thesis, only a more modest recognition that armaments are an important part of the story of how Europe, and ultimately the world, waged a calculated war to achieve radically different visions of the political “fortunes” that Shakespeare’s Marcus Brutus so eloquently extolled. As an avid reader of H-Diplo reviews, I am delighted that Cry Havoc was selected for a roundtable. My thanks to Tom Maddux for organising it and to Marc Trachtenberg, David Stevenson, Wesley Wark, Talbot Imlay and Michael Horowitz for their thought-provoking criticism and generous praise. Responding to their reviews is a great opportunity to reflect on the issues that prompted me to write the book, and I am grateful for the chance to do so. Arguing that anticipated shifts in the military balance compelled leaders to make choices about war or peace is not the same as arguing that the arms race determined what those choices would be. And arguing that a passing strategic advantage – a ‘window of opportunity’ – offers an incentive to act is common in security studies and in the historiography on arms races. All four reviewers agree that the arms races of the 1930s raised global tensions and in that way contributed to the outbreak and expansion of the war. Stevenson and Horowitz accept that there were connections between an out-of-control arms race and the decisions for war, but Wark and Imlay do not. One reason why I think the latter two reviewers do not accept my thesis is that they mistake the deliberately provocative subtitle of the U.S. edition of Cry Havoc with the more conventional and nuanced argument that I have summarised above. Wark and Imlay’s criticisms also originate in fundamental historiographical and conceptual differences between us, which I hope to fruitfully highlight in my reply. Wark argues that I overreach myself when I claim that the arms race played an essential role in determining the timing of the war’s outbreak, its expansion, its belligerent line-up and the manner in which it was fought. The real determinant, he maintains, was the growing ideological and political antagonism between the European Great Powers. France and Britain were not driven into war by an arms race that was spiralling out of control, but by the failure of ‘appeasement’ and a growing moral outrage at Germany’s aggressive and militant behaviour. Why Wark divorces the political-ideological antagonism from the arms rivalry is unclear. After all, political purposes govern arms races. States strive to achieve favourable military conditions for political-ideological ends. Competitors race to impose their will with threats or the use of force, or to ward off such threats. I argue that the political-ideological and the military rivalry of the 1930s worked together as both cause and consequence of rising international tensions with a ratcheting up effect. Nonetheless, in explaining the outbreak of war in 1939, I do place more weight on the arms race. I will have more to say about the role of ideology when I reply to Imlay, but for now I will respond to Wark by pointing out that it was the Nazi regime’s fast-growing armaments and war potential that made it a threat that had to be contained through diplomacy and deterrence and then, when that did not work, a foe that had to be defeated. As Stevenson correctly summarises it, my argument about Britain and France in 1939 is that the general trend in the arms race – Britain and France’s growing armaments, the sense that Germany had reached its military-economic peak and that time was working for them – encouraged Neville Chamberlain, Edouard Daladier and their top advisors to risk war and accept it if it came. For the French, the fact that Britain had begun to conscript a continental army and to coordinate its war plans with them also provided a powerful source of fresh confidence in the summer of 1939. That argument does not exclude other factors such as shifts in public opinion, outrage at Hitler’s double-dealing diplomacy and revulsion at the Nazi persecution of the Jews, reinforcing the growing confidence in London and Paris that the arms balance was turning their way, but I cannot credit a counterfactual scenario in which those factors outweigh the military calculation. Would France and Britain have gone to war against Germany in September 1939 had their political and military leaders concluded that they could not defeat the initial German attack and win a long war? Wark may think so, but I do not. Wark’s suggestion that the decisions taken in Rome and Moscow in 1939 to stay out of the European war because of arms-race pressures contradict my argument stems from his confusion about what my argument is. That Rome and Moscow calculated that the state of their armaments and war capacity ruled out early intervention in the war confirms my argument about the crucial role played by arms calculations in determining the timing of the decisions for war and the line up of belligerents at each stage of the conflict’s expansion. Wark argues that the shifting military balance had little to do with Hitler’s decision for war in 1939. He is more convinced by my references to Hitler’s “sense” of “destiny”, his “regret” at having lost his “nerve” in 1938 during the Czechoslovak crisis, and his “sheer rage” at British interference as indicative of the crucial considerations playing on the German dictator’s mind. For me an account of war’s outbreak that dwells on the volatile Führer being prompted by a fit of anger into shouting ‘let slip the dogs of war’ is grossly inadequate. Once again there is no dispute between Wark and me about the fact that Hitler willed war in 1939 by ordering the destruction of Poland, or that he was from the start of his regime bent on total war. But why did Hitler, against the advice of his military men, risk a long war against Britain and France in 1939 when he had originally intended as a first stage in his imperialistic programme to wage total war against the Soviet Union in the early 1940s? To answer that question Karl Marx’s dictum on Louis Bonaparte is perhaps more helpful than Shakespeare’s Julius Caesar: “Men make their own history, but they do not make it as they please; they do not make it under self-selected circumstances, but under circumstances existing already, given and transmitted from the past.” Hitler’s decision for war in 1939 cannot be seen in isolation from the earlier four years of diplomatic and military rivalry in Europe or his failed bid to escalate German arms in 1938-39. As I show in Cry Havoc, in the summer of 1935 Hitler was very optimistic about Germany’s prospects for stealing and sustaining a lead in the arms race. Two years later, however, that optimism had faded. During 1937 the scale of German rearmament had slowed owing to the limitations imposed by the economy. As Hermann Göring, head of the Four Year Plan, put it, rearmament had “reached a plateau”. (158) Meanwhile, the rearmament schemes launched by the other powers in 1935-36 had gained momentum. Also, Britain and France (once the French organised themselves) had a long way to go before being constrained by a lack of resources or industrial capacity. At a meeting of his top officials in November 1937, Hitler spoke of acting sooner than he had expected against Austria and Czechoslovakia in opposition to Britain and France because Germany’s lead in the arms race was a wasting asset. That shocked the generals who were present because they knew that even if Germany had a temporary head start in the arms race, in a long war that would test the military-industrial capacity of Germany against France and Britain, and probably the Soviet Union and the United States too, Germany was bound to lose. What I and indeed others have found striking about the evidence for Hitler’s thinking about the European scene from 1937 onwards is the consistency with which he spoke of time working against him and of Germany’s relative advantage in the arms race diminishing as other powers armed with greater intensity. Here I will pick up on Trachtenberg’s interesting point (citing Raymond Sontag) about the diplomatic crises of 1938-39 spinning out of Hitler’s control and causing a world war in 1939 that he did not intend for some years to come. That thesis was based on a shrewd reading of the diplomatic documents, but I no longer think it is sustainable now that we know so much more about the larger diplomatic, economic and military context. Indeed, it is not clear why in the case of Hitler in 1939, Trachtenberg separates the diplomatic crisis from the shifting military balance. The diplomatic crises, after all, prompted all the powers (including the United States) to spend more on arms and to speed up existing military programmes. In a cumulative process similar to what Stevenson has labelled the “militarisation of diplomacy” from 1905 to 1914, I see the political and the military competition of 1938-39 working together in a rapid sequence of crises. What Hitler learned from the reaction of Britain, France and other powers to the Anschluß of March 1938, the ‘weekend’ crisis of May 1938, and the Czechoslovak crisis September 1938 was that the harder he pushed against the military-diplomatic constraints his opponents placed upon him, the greater and faster they armed and, in the case of London and Paris, the more united their response became. One solution to that problem was to out-gun Britain and France in one final spurt of arming. Hitler tried that after the Munich crisis, but his attempt to escalate the scale and pace of German arms growth, especially in air forces and a gigantic navy aimed at Britain, failed in 1939 owing to economic constraints. The acceleration of British and French military measures that year and their guarantees to Poland and Romania in reaction to Germany’s occupation of the rump Czech state in March 1939 only confirmed what Hitler already knew. Thanks to the arms race, time was working against him. Aside from his confusion of my subtitle for the Frankenstein-free argument that I have summarised above, there are historiographical differences between Wark and me. Clues to what those differences are can be found in his review. Note that Wark suggests that my chapters should be read as individual “essays” about national policies, rather than as interlocking and interacting parts of a larger international narrative. Chamberlain and Daladier, he writes, were “hardly men of Shakespearean stature” because they misjudged Hitler. In other words, Wark adheres to the ‘guilty men’ orthodoxy that Cry Havoc challenges. According to that interpretation of the international politics of the 1930s, to explain the war, we need look no further than to the personality flaws and naïve policies of the ‘appeasers’, and how cunning and wicked dictators outwitted them. That ‘guilty men’ orthodoxy originated in the anti-appeasement polemics of the 1940s, and it now comes in a more elaborate form called counter-revisionism. The revisionists had argued that British and French leaders were not ‘guilty men’ because structural constraints on them such as pacifist public opinion, the economic slump, unreliable allies and a lack resources to meet multiple threats made ‘appeasement’ the only rational response to what was an intractable strategic situation. The counter-revisionists replied that the constraints were mere excuses made by the ‘appeasers’ to justify flawed policies and to exclude better alternatives. ‘Appeasement’, so the counter-revisionists contend, was a bad policy choice born of a naïve faith in human reason and lasting peace, a lack of political will to take command and a serious misreading of the threat. What struck me about this debate is the way in which each side privileges either structure or agency in their interpretation. The revisionists hold that structural constraints produced the policies of London and Paris, while the post-revisionists argue that flawed human agency ran supreme. The embedded counterfactual in the latter case is that if men other than Daladier and Chamberlain had been at the helm in Paris and London – men of ‘Shakespearean stature’ presumably – then better policies would have been pursued. As my earlier reference to Marx’s dictum indicates, I think that any explanation of the war’s origins which does not admit that structure and agency are dialectically interconnected, and which does not account for how they worked together, is deeply flawed. Cry Havoc is my attempt to explain how agency and structure interacted in the 1930s at the national and international levels. As Stevenson and Horowitz point out, the explanatory weight of my book is at the systemic level. I examine how governments tried to cope with rapid changes and rising pressures generated at the international (systemic) level by an arms race that escalated beyond their (unit-level) control. While praising my book as “genuine” international history, but urging that my chapters should be read as separate essays on internal policy-making, Wark misses the point. International history is more than the analysis of internal policy-making, because international systems generate effects that are greater than the sum total of national decisions and bilateral interactions. Even under less severe competitive conditions than a spiralling arms race, the international system constrains the conduct of states and shapes their national policies, both external and internal; in a spiralling arms race, as I show for the 1930s, these system effects became much more pronounced. In contrast with Wark, Imlay accepts that no state “armed in a vacuum” and that there were “interactive effects” caused by the growing frequency and intensity of international cycles of military-political action and reaction. He praises me for showing that national rearmament programmes “cannot be divorced from the political, military and strategic developments both within each country and between them.” Yet, at the same time, he criticises me for arguing that the arms race played “an independent role in national and international politics”. I find his praise and criticism contradictory. Did the “interactive effects” caused by intensifying arms competition have an impact on national military, political and strategic developments? If Imlay’s answer is yes, then those “interactive effects” did play an independent role in national and international politics. I think Imlay’s use of the Frankenstein metaphor reveals that he finds my arms-race argument troubling because it appears to him to reduce people to cogs in a giant military machine, yet, speaking as a reader and great admirer of his work on Britain and France in the 1930s, I very much doubt that he would argue that statesmen are endowed with unfettered powers of agency and free will in either domestic and international politics or economics. In my view international history must account for how structures and agents interact over time at the systemic and unit levels. Imlay treats structure and agency as dichotomous. Apparently for him a system-level explanation invariably becomes completely deterministic because he cannot account for the dynamic interplay of structures and agents. Horowitz poses an astute counterfactual that is useful for my reply to Imlay. What if, he asks, there had been a Hitler but no arms race? That was in fact precisely what Hitler wanted: a world in which Germany was free to seize uncontested military supremacy. But he did not achieve that goal because others armed against him. Likewise Mussolini wanted a Europe that stood still while Italy armed; Stalin wanted the capitalist world to stand still while the Soviet Union industrialised and armed; and the Japanese army officers who planned the conquest of Manchuria in 1931 wanted Russia, China and the rest of the world to stand still while the Japanese empire turned itself a self-sufficient bastion for waging total war. The arms race wrecked all of these master plans. It also dashed the hopes of Chamberlain, Leon Blum and Franklin Roosevelt of championing peace, prosperity and social progress instead of great armaments. It also undermined French, British and American plans to arm just enough to deter and to contain Germany and Japan. Thus, when I argue that the arms race played an independent role in international and national politics, I do so because none of the competitors could master it to achieve their political goals. To their frustration, the dynamics of competition generated political, economic and strategic consequences that were independent of the direct actions or desires of national policy-makers. While I think Imlay would probably accept that the complex dynamics of arms competition did produce unintended strategic consequences, he rejects the idea that the pressure to compete internationally affected the internal makeup of the competitors. He criticises me for arguing that the arms race compelled all of the fast-arming powers to impose greater state control over economic and social life. He suggests that I developed a “model” of the totalising state that closely fits the Soviet Union and that because the other Great Powers do not fit that model my argument about systemic pressures shaping and shoving all the competitors in the same direction of greater state control is unconvincing. Let me make it clear that I did not argue that the arms race or the war turned all the Great Powers into the Soviet Union. As Imlay admits, I analyse variations in national responses to the identical problem of how to arm for industrial-age total war, including the different ways in which states intervened in their economies to manage markets and to raise munitions output. Since Imlay’s expertise lies in comparative domestic politics and economic policy, I can see why those differences are of greater interest to him than the similarities between national policy debates and parallel organisational responses to the arm race. Yet, in stressing the national differences, he fails to see that the international similarities are indicative of a general trend of military-economic convergence among the Great Powers driven by escalating arms competition. In Cry Havoc I did not develop a “model” of the totalising state. The First World War produced compelling exemplars. Interwar policy makers learned a prime lesson from that total war. Future wars would be won by the powers with the capacity to mobilise their whole economies and societies. Mobilisation on that scale required a powerful state to regiment people and to direct the maximum of productive resources to armaments. It also required extensive pre-war planning and organisation to manage the transition from a peacetime economy to a war economy, and that the state had within its reach sufficient raw materials for the long haul. After 1914-18, the concept of arming embraced much more than simply the stockpiling of weapons. Everywhere war planners and their allies in the state and industry saw regimented societies and state-managed economies as requisites to winning the arms race and total war, and they pressured political leaders to intervene more deeply in the economy and society to arm. As I argue in Cry Havoc, the rising internal and external pressures to adopt what were described as the ‘totalitarian’ methods of arming were embraced by some, while others adopted strategies to buck the totalising trend. Stalin, Mussolini and Hitler embraced it. Communism, Fascism and National Socialism emerged from the cataclysm of 1914-18 with the goal of total economic and social mobilisation in anticipation of future war as a key tenet. Likewise, the ‘total war’ officers in Japan and their allies in the civil service and ruling elite championed remodelling the Japanese empire along totalitarian lines. The liberal powers, Britain, France and the United States, which after their victory in 1918 promoted disarmament, free markets and the peaceful resolution of international disputes, tried to cope with the emulate-or-capitulate logic that the all-out arming of Germany, Japan and Italy confronted them with by adopting strategies of limited rearmament premised on deterrence and containment. One important but neglected reason why the democratic powers opted for deterrence and diplomacy (appeasement) instead of matching the dictatorships gun for gun, factory for factory, was the belief that to do so would eventually mean succumbing to totalitarianism. In his review, Imlay dismisses the prevalent fear in the democratic countries that the only way to match the dictatorships in the arms race was to abandon free-market economics and the liberal way of life for totalitarianism. He claims that because I take this often-expressed anxiety and the evidence for it seriously I am somehow confusing “rhetoric with reality”. In my view past thought is part of the reality scholars should reconstruct when writing history. We should take seriously how past decision-makers thought the future might unfold because it tells us much about why they acted the way they did. The belief that there were limits to how far a liberal democracy could arm for total war without resorting to authoritarian methods of social and economic control was not just the view of a few politicians such as Blum, Chamberlain and Roosevelt. That premise was widely accepted by top military experts, political thinkers and economists of the right and left. It was a powerful intellectual current of the day that ran through the writing of thinkers as different as the English futurologist H.G. Wells and the Austrian economist F.A. Hayek. Imlay writes that the “biggest problem” with my book is that it “downplays the ideological mainsprings of rearmament policy”, in particular for the aggressors. I think most readers will find this criticism is at odds with the summaries of my arguments above and with the analysis in Cry Havoc of the ideologies of leading statesmen, solders and officials, the tracing of the origins of the totalising ideologies back to the sweeping mobilisations of 1914-18, and the analysis of the commonalities between the prevailing military theory of future war (the “optimal” way to arm for total war, as Horowitz nicely puts it) and the totalising ideologies. In Cry Havoc I treat ideology much the way Douglas MacDonald has proposed on H-Diplo. I agree with him that structure and agency each only offer a partial causal explanation for political conduct, that their relative importance will change as circumstances change over time, and that both ideational and structural analyses are required to fully capture the complexity of international politics. Imlay’s view that the “the radicalizing dynamic pulsating through international politics during the 1930s” was fascist-imperialist ideology is a partial explanation for the coming of the arms race and the world war. It raises more questions: where did fascism spring from, how did the pursuit of ideologically derived goals by all the Great Powers interact with each other over time to generate the “dynamic pulsations” he refers to, and did the dynamics of escalating arms competition produce unintended consequences and outcomes? Turning to Horowitz, I believe I have already answered some of his questions in my replies to Wark and Imlay. As he points out, I did not set out to directly engage with the International Relations and Security Studies literature, but I am keen to learn what scholars in those fields make of Cry Havoc. I have learned a lot from the debates between Realists, Liberals and Constructivists and, as an international historian, I have tried to take their insights into account. Horowitz asks me to comment on the relative impact of the arms race on the war’s inevitability. As I noted earlier, I argue what made the war inevitable was Hitler’s determination to wage one. The arms race played an essential role in determining the timing of the war’s outbreak and its expansion. Horowitz quotes the counterfactual on page 43 of Cry Havoc about the inevitability of an arms race with or without Hitler. I left the question of whether an arms race without Hitler would have ended in a world war or cold war unanswered. A case can be made for both possibilities, but on balance I think that at least to the early 1940s a cold war rather than world war would have ensued. A military regime in Berlin would have armed fast, but generals such as Werner von Blomberg and Werner von Fritsch were prudent men in no hurry to provoke a total war against a superior coalition that they calculated would crush them. How they would have reacted to the waning of any short-term advantage that Germany might have gained by arming first and fast is more difficult to say, for that would have depended on the political constellation of the powers. My guess is that an accommodation between Britain, France and Germany probably would have occurred. The armaments rivalry in Europe, including Russia, and in Asia between Russia and Japan, would have certainly continued, though in fits and starts rather than in a spiralling arms race. While I do not shy away from counterfactual reasoning, I think Horowitz’s question about how a democratic rather than a Soviet Russia would have altered events violates the “minimum-rewrite-of-history-rule”. So much European and world history would have been different if the 1917 revolution had resulted in a liberal democracy that I cannot project into the 1930s similar strategic circumstances to those that occurred. However, I have written elsewhere about Anglo-Soviet naval diplomacy in the 1930s that perhaps sheds light on the issue that Horowitz raises. In that article I argue that London and Moscow were able to reach a temporary deal in 1937 whereby Stalin exchanged his signature on a naval arms control treaty for British aid in the build up of his fleet. As the Russian archives reveal, Stalin and his planners calculated that the entire regime of naval arms control soon would collapse, and so for them Soviet adherence to the treaty was an empty gesture. The British, who saw naval arms control as a vital means to prop up their naval supremacy, carefully restricted their aid to ensure that only second-rate naval technology was passed to Russia. In other words, any security cooperation between London and Moscow was severely limited by their mutual ideological hostility and incompatible long-term goals. Horowitz asks why military men the world over learned the same basic lessons from the First World War? Part of the answer lies in the sheer scale of the cataclysm of 1914-18. That war was experienced in some way by all of the leading politicians, soldiers and businessmen who had leading roles in the 1930s. What struck me about the archival and printed sources about the lessons of the war and forecasts of future war was the unanimity. “Modern war,” as one military thinker put it, “is no longer a clash of armies, but a struggle for the existence of the peoples involved. All the resources available to a warring nation must be pressed into service, not just the population, but also industry and the economy.” (46) Part of the answer also lies, as Horowitz says, in the realities of what it would mean to turn whole industrial economies and societies into war machines. The great-power war planners were all responding to the same problem. That does not mean that every staff officer thought that planning and organizing his country for total war was best. As I point out in Cry Havoc, in Japan, France and Italy, some senior officers did suggest sacrificing manpower and staying power for small but highly mechanized armies and advanced air and naval forces. Arguably, that would have been the optimal defense solution for Italy and Japan, neither of which had the raw resources to sustain a total war. The fact that Italy and Japan did not opt for the alternative is testament to the push and pull of interstate competition as well as normative concerns framed within the prevailing international political order of the era: after all, part of what it meant to be a Great Power was possessing the capacity to wage total war. Finally, Horowitz notes that the core of my narrative focuses on Europe and that Japan gets treated most at the start and end of the story. This organisation of the book is deliberate. Europe was the epicentre of the arms race. Many international observers predicted war between Japan and the Soviet Union in the 1930s, but both powers wanted to avoid it. Without events in Europe unfolding as they did from 1939 to 1941, and the United States responding to those events the way it did, I cannot see the Japanese leadership deciding to make a now-or-never choice for more war in December 1941. In closing, thanks once again to my reviewers for their praise and criticism, and to the editors of H-Diplo for the opportunity to respond. Raymond Sontag, “The Last Months of Peace, 1939,” Foreign Affairs 35: 3 (April 1957): 508 and 524. As American editor-in-chief at the German documents project from 1946 to 1949, Sontag had gone through much of the German archival material that had fallen into the hands of the western allies in 1945. The goal of the project was to select key documents for publication in what would become the important series Documents on German Foreign Policy, 1918-1945. See Andreas Hillgruber, “Der Faktor Amerika in Hitlers Strategie 1938-1941,” in Wolfgang Michalka, ed., Nationalsozialistische Aussenpolitik (Darmstadt: Wissenschaftliche Buchgesellschaft, 1978), esp. pp. 522-523. This article was originally published in Aus Politik und Zeitgeschichte (supplement to Das Parlament), May 11, 1966. See also Adam Tooze’s very important book, The Wages of Destruction: The Making and Breaking of the Nazi Economy (New York: Viking, 2006), especially pp. 328, 337, 407-408, 502-505, 666. Samuel P. Huntington, “Arms Races: Prerequisites and Results,” Public Policy, Vol. 8 (1958), pp. 41–86; Lewis Ray Richardson. Arms and insecurity: a mathematical study of the causes and origins of war (Pittsburgh, PA: Boxwood Press, 1960). For an example of a more statistically oriented work drawing a link between arms races and conflict, see Michael Wallace, “Arms Races and Escalation: Some New Evidence,” Journal of Conflict Resolution, 23:1 (1979): 3-16. Paul Diehl, “Arms Races and Escalation: A Closer Look” The Journal of Peace Research, 20:3 (1983): 205-212. For examples of recent work, see Elizabeth Saunders, Leaders at War (Ithaca, NY: Cornell University Press, 2011). Also see Hein Gomens and Giacomo Chiozza, Leaders and International Conflict (New York: Cambridge University Press, Forthcoming). Finally, see Michael Horowitz, Allan Stam, and Rose McDermott, “Leader Age, Regime Type, and Violent International Relations” Journal of Conflict Resolution, 49:5 (2005): 661-685. Richard K. Betts, Soldiers, Statesmen, and Cold War Crises (Cambridge, MA: Harvard University Press, 1977), p. 164. For example, see G.C. Peden, British Rearmament and the Treasury, 1932-1939 (Edinburg: Scottish Academic Press, 1979); Paul Robert Shay, British Rearmament in the Thirties: Politics and Profits (Princeton, NJ: Princeton University Press, 1977); Philippe Garraud, “La politique française de réarmement de 1936 à 1940. Une production tardive mais massive”, Guerres mondiales et conflits contemporains 55 (2005), 97-113; Robert Frankenstein, Le prix du réarmement français (1935-1939) (Paris: Publications de la Sorbonne, 1982); Adam Tooze, The Wages of Destruction: The Making and Breaking of the Nazi Economy (London: Allen Lane, 2006); and Lutz Budrass, Flugzeugindustrie und Luftrüstung in Deutschland 1918-1945 (Düsseldorf: Droste, 1998). One exception is Italy. According to Jari Eloranta’s figures, Italy’s military burden only briefly surpassed 5% during the 1930s, and this because of spending associated with the wars in Ethiopia and in Spain. By 1938 Italy’s burden was dropping below 5%, while those of Germany, Japan and the Soviet Union were well above 10%; those of France and Britain were already above 5% and climbing fast. As for the United States, it had yet to enter the race. Eloranta, “Military Spending Patterns in History”, available at: http://eh.net/encyclopedia/article/eloranta.military . See Peter A. Hall and David Soskice, eds., Varieties of Capitalism: The Institutional Foundations of Comparative Advantage (New York: Oxford University Press, 2001). To be sure, this a big generalization but one, I believe, that contains a core of truth. For a good introduction to war economies, see Mark Harrison, ed., The Economies of World War II: Six Great Powers in International Comparison (Cambridge: Cambridge University Press, 1998). In an earlier publication, I argued that Britain and France adopted opposing political-economic approaches during the 1930s in response to rearmament, with the French opting for an uncoordinated approach in which the government imposed little direction or organization on the overall effort, and the British opting for a coordinated approach in which government and non-government officials assumed responsibility for important economic tasks. Focusing on only two cases probably led me to over-state the differences between France and Britain, a suspicion underscored by my reading of Cry Havoc. What strikes me now is the durability and adaptability of capitalism before and during the war in the major belligerent countries with the obvious exception of the Soviet Union. While perhaps not a story of capitalism triumphant, the period might be cast as one of capitalism regnant. For the publication in question, see Talbot C. Imlay, “Democracy and War: Political Regime, Industrial Relations and Economic Preparations for War in France and Britain up to 1940”, Journal of Modern History 79 (2007), 1-47. During the 1920s there was a good deal of disagreement on the lessons to be drawn from the recent experience of “total war”. See Andrew Barros, “Razing Babel and the Problems of Constructing Peace: France, Great Britain, and Air Power, 1916-28”, English Historical Review, forthcoming. For the background to Goebbels’ speech, see Peter Longerich, “Dokumentation: Joseph Goebbels und der totale Krieg. Eine unbekannte Denkschrift des Propagandaministers vom 18. Juli 1944”, Vierteljahrshefte für Zeitgeschichte 35 (1987), 289-314. For Italy’s empire, see Davide Rodogno, Fascism’s European Empire : Italian Occupation during the Second World War (Cambridge: Cambridge University Press, 2006); and Angelo Del Boca, Italiani, brave gente? Un mito duro a morire (Vincenza: N. Pozza, 2005). For the Japanese empire, see Louise Young, Japan’s Total Empire: Manchuria and the Culture of Wartime Imperialism (Berkeley, CA: University of California Press, 1998). Maiolo quotes from this meeting on pp. 156-57, but I use the citation in Jost Dülffer, “Die ‘Gruppe Otto Wolfe’ 1929 bis 1945” in Peter Danylow and Ulrich S. Soénius, eds., Otto Wolf: Ein Unternehmen zwischen Wirtschaft und Politik (München: Siedler, 2005), pp. 175-76. Robert Frankenstein (now Frank), Le Prix du réarmament français, 1935-1939 (Paris: Publications de la Sorbonne, 1982); Martin Alexander, The Republic in Danger: General Maurice Gamelin and the Politics of French Defense, 1933-1940 (New York: Cambridge University Press, 1992); Richard Overy, War and Economy in the Third Reich (Oxford: Clarendon Press, 1994); Adam Tooze, The Wages of Destruction: the Making and Breaking of the Nazi Economy (London: Allen Lane, 2006); John Gooch, Mussolini and his Generals (Cambridge: Cambridge University Press, 2007); MacGregor Knox, Hitler’s Italian Allies: Royal Armed Forces, Fascist Regime and the War of 1940-1943 (Cambridge: Cambridge University Press, 1943); George Peden, British Rearmament and the Treasury, 1933-1939 (Edinburgh: Scottish Academic Press, 1979); Joseph Maiolo, The Royal Navy and Nazi Germany, 1933-1939: a Study in Appeasement and the Origins of the Second World War (New York: St. Martin’s Press, 1998). This is only a selection of a large body of distinguished work. Donald Cameron Watt, How War Came: The Immediate Origins of the Second World War 1938-1939 (London: Heinemann, 1989). See for instance the seminal work of two of my reviewers: David Stevenson, Armaments and the Coming of War in Europe 1904-14 (Oxford: OUP 1996); Marc Trachtenberg, ‘“A Wasting Asset’: American Strategy and the Shifting Nuclear Balance, 1949-54”, International Security 7 (1988-89), 5-49. The subtitle of the UK edition published in March 2010 by John Murray is The Arms Race and the Second World War, 1931–41. My account of the impact of the arms race on Hitler’s strategic calculations from 1937 to 1940 follows that of other scholars, principally Jost Dülffer, “Der Beginn des Krieges 1939: Hitler, die innere Krise und das Mächtesystem”, Geschichte und Gesellschaft 2 (1976), 443-470; Richard Overy, War and Economy in the Third Reich (Oxford: Clarendon Press, 1994); Adam Tooze, The Wages of Destruction: the Making and Breaking of the Nazi Economy (London: Allen Lane, 2006). David Stevenson, “Militarization and Diplomacy in Europe before 1914”, International Security, 22 (1997), 125-161. For a survey of the historiography, see Patrick Finney, Remember the Road to World War Two (London, Routledge, 2011), 188-225. The agent-structure problem is rarely addressed by international historians but is salient to recent debates in international relations: see Peter Jackson, “Post-War Politics and the Historiography of French Strategy and Diplomacy before the Second World War”, History Compass 4/5 (2006), 870-905; and Alexander Wendt, “The Agent-Structure Problem in International Relations Theory”, International Organization 41 (1987), 335-370. On the importance of the systemic approach see Paul W. Schroeder, The Transformation of European Politics, 1763-1848 (Oxford: OUP, 1994); Robert Jervis, Systems Effects: Complexity in Political and Social Life (Princeton NJ: Princeton University Press, 1997). As Barry Buzan and Richard Little point out in International Systems in World History (Oxford: OUP, 2000), 84-9, 103-8, the objection that a systemic approach dehumanises people is a common but mistaken one in the social sciences and history. Gregory Mitrovich, Undermining the Kremlin: America’s Strategy to Subvert the Soviet Bloc, 1947-1956 (Cornell University Press 2000), 5. My thanks to Professor Robert Jervis for pointing me to Mitrovich’s book. Philip E. Tetlock and Aaron Belkin, Counterfactual Thought Experiments in World Politics: Logical, Methodological, and Psychological Perspectives (Princeton NJ: Princeton UP, 1996), 23.